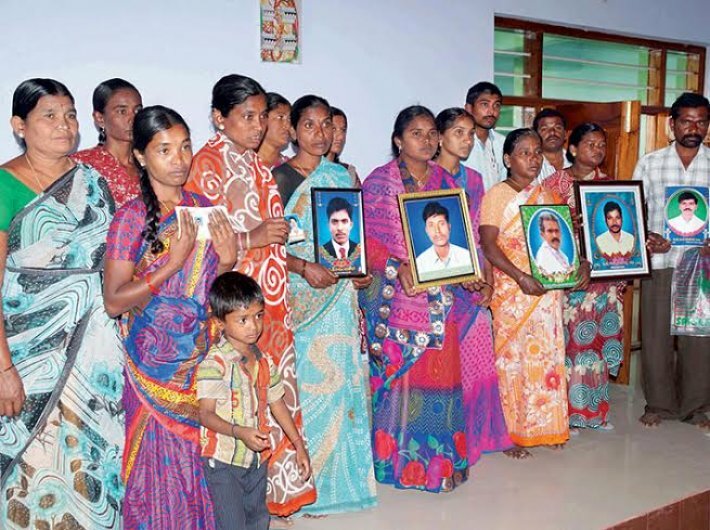 Families of farmers who committed suicide, at Warangal district headquarters. Wednesday, July 2 was the last day of Peraboyina Sampath’s life. That day, in the evening, he walked into his dusty field, gulped down some pesticide and waited for all his miseries to get over. The 32-year-old farmer worked in the near-barren farm at Seetharamapuram village under Parakala Mandal in Warangal district of the new state of Telangana. He was under a lot of pressure to pay back the debt of more than Rs2 lakh he owed to banks and money lenders. He had told his wife he would kill himself if the crop failed this time too. Next day, his wife found his body. Now she has to take care of their son and daughter – with no means of income. Her only hope is some ex-gratia relief from the state government. Months later, on November 10, a high-voltage drama was on in the state assembly. The opposition was armed with accusations and the Telangana Rashtra Samiti (TRS) government was dodging the bullets of words. As many as 2,014 people (1,554 men, 460 women) involved in farming and agriculture activities committed suicide in undivided Andhra Pradesh last year, according to data put together by the CID, Telangana state. The highest number of farmer suicides last year was in Mahabubnagar district (287) which is now in Telangana, followed by Anantapur (256) in Andhra. The figures for other Telangana districts are: Karimnagar (147), Medak (113), Khamma (135) and Ranga Reddy (107). But 170 km away from the state capital Hyderabad, in a village panchayat of Cheriyal under Warangal district, Kanduri Illama could not stop her tears, watching on television the assembly discussion on farmer suicides. On August 11, this year, her husband hanged himself to death near an open well in their farm. Narrating how her husband Mallaiah, 45, committed suicide, a wailing Illama said her world came crashing down that day, and she did not know how she would raise her three daughters. Mallaiah had grown cotton and maize on four acres, but half the land failed to yield anything. He had been borrowing money from local money lenders over the past few years. This year they all had great hopes of good rains and good harvest. But all their hopes and efforts went in vain, Illama said. Their eldest daughter, Rajitha, was married early this year but was sent back after her in-laws’ dowry demands could not be met. Bhavani, 18, is a BCom student, and the youngest daughter is in Class 9. Bhavani said two acres of the land belonged to her father as a joint property and it was not registered in his name. So he could not avail loan against it from a bank. He was forced to turn to small-time money lenders for help. His total debt was '4 lakh, and interest on it was piling up. Now, Illama and her daughters are forced to do petty work in the neighbourhood to survive. Two of the daughters have to earn their daily bread instead of going to college or school. The same story of a failed crop, huge debt, and the ending of one’s life is replicated across the state. In Angadipeta village of Chandur Mandal in Nalagonda district – 160 km from Illama’s village, moneylenders’ threats pushed Maragoni Venkataiah, 45, to take his life by hanging himself from a tree on his farm. He left behind his wife, two teenage daughters and a son without any livelihood. In Damara Cherla mandal, Malothu Ravi consumed pesticide when his wife was away to bring their two school-going sons home. Ravi had invested Rs 2.50 lakh but the crop failed. Telangana chief minister K Chandrasekhar Rao or KCR, who promised a ‘Bangaru Telangana’ or golden Telangana when he took over, says his government cannot be blamed for the state’s agriculture crisis. He blames his counterpart in the neighbouring Andhra Pradesh, N Chandrababu Naidu, for Telangana’s woes. “The Andhra Pradesh CM has, it seems, taken a vow to deprive Telangana of power and water share, so that crops on our fields dry up. We will not let that happen,” KCR said at a public meeting in Malkajgiri in Hyderabad. Naidu, whose Telugu Desam Party is in opposition in Telangana, has countered KCR’s accusation by accusing him of gross mismanagement. He alleged the TRS government had failed to plan ways to combat the shortage of water and power and now wanted to pass the buck. “Let them hand over the power portfolio to us for two weeks and we will show them what can be done,” Naidu said recently. On the same day, Vangari Anjaiah of Maripadi village in Gundala mandal was also found hanging from the ceiling at his home. In Chadari village of Raupet mandal, Rajaiah, a 42-year-old maize farmer, ended his life by consuming pesticide. B Narasimha Rao, joint director, agriculture, said the farmers of Rajupet and Alair mandals had taken up maize cultivation in about 2,000 hectares, but most of the crop had withered away due to scanty rainfall. Despite the recent rains, the district recorded 50 percent deficient rainfall during the southwest monsoon, leaving the farming community in the lurch. The two most affected districts of Telangana – Warangal and Nalgonda – witnessed an alarmingly high number of suicides during this Kharif season. The primary reason for their plight is crop failure due to poor rains coupled with a nonexistent irrigation system and debt burden. Another factor in this unfolding tragedy is the system of tenant farming, which is widespread in Telangana. Farmers typically own one or two acres of land, but take more land on rent from landlords. Krishnaiah, a tenant farmer in Karimnagar, had no agriculture land. He used to lease farmland in his native village. This time too he took four acres of land on lease but his crop failed because adequate power was not available. In the process, he incurred debt to the tune of '2.5 lakh. Unable to pay back after the crop failure, he consumed pesticide and committed suicide on September 23. “A majority of the victims are tenant farmers who pay very high interest rates to lease land, often paying up to '10,000 per acre per season. When their crop fails, they are left in debt. With private financiers hounding them, they take their own lives,” said RTI activist B Kondala Reddy who is associated with Rythu Swarjya Vedika, and Caring Citizens Collective, an NGO. While the government pegs the total number of farmer suicides at 79, the grassroots organisation Rythu Swarajya Vedika and the opposition Congress’s farmer wing Kisan Congress put the figure at 350. M Kodanda Reddy, chairman of Telangana Kisan Congress, called the government estimates “bogus”. Agriculture minister P Srinivas Reddy blamed the previous Congress government for the plight of farmers. “The previous government did not create proper irrigation facilities nor has it bothered about the welfare of farmers. The farm loan waiver of the TRS government will aid the farmers immensely,” he said, when asked about the alleged suicides. Soon after assuming charge the TRS government under chief minister K Chandrasekhar Rao announced a scheme to waive crop loans and gold loans up to '1 lakh for farmers. The government said waiving the loans of 3.9 million farmers would put a burden of '17,000 crore on the state coffers but it was ready to take it on, as it was an election promise. However, this applies only to bank loans, and brings no relief to the farmers facing heat from private money lenders. Also, farmers continue to suffer from power crisis, which needs to be resolved to let them breathe easy.